Our team has extensive experience doing work on websites. If you know what you want done, odds are we've done it before. Let us know what you are looking for. Since 1997, we have been helping small and medium sized business establish creative and functional web sites that effectively promotes their goods and services. It all starts with your web site. Big or small, simple or complex, we have a solution for you. 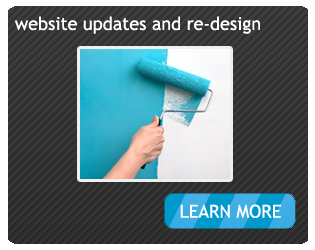 Day to day, week to week, or month to month site updates and support No time to update your site? Want the security of having an entire web company at your disposal? Running your business and trying to keep your products and web site updated can be a daunting task. We provide both web site updates and month to month management. We have provided Web App development for more than a hundred clients including some you may recognize: Warner Brothers, Universal Studios, Interscope Records, Dr. Scholl's (Brown Shoe Company) and more. Since 1997, we have been helping small and medium sized business establish creative and functional web sites that effectively promotes their goods and services. We have seen a lot of expensive SEO services online and think that it just shouldn't have to cost that much. But then again, we have low overhead, and are able to pass our savings on to your customers. In that spirit, we have developed a set of SEO packages that can be offered at a price that's far less than many other companies offer. © 1997-2013 Robust Technology, LLC.